Californian Moon Kim outlasted 363 opponents to secure his first World Poker Tour (WPT) crown by taking down the Bay 101 Shooting Star main event in San Jose for an impressive $960,000 – his biggest ever pay day. Kim, from Dublin in California, also picked up a seat worth $25,000 for the season-ending WPT Championship in May, as well as a WPT Champions trophy, after defeating Ubaid Habib in their heads-up battle that left the runner-up with $570,200 from the $3,458,000 prize pool. 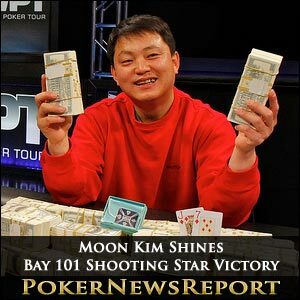 Kim’s previous best cash came in August of 2007 when he won the $2,000 buy-in Spread Limit Hold’em Championship from the Bay 101 Open for $85,000. The eventual champion started Day 4 with a medium chip stack, but fought hard to outlast players such as Joe Serock and Erik Cajelais at the six-handed final table to emerge victorious from his head-to-head with Habib. Kim, who had eliminated Albuquerque’s Serock in third place for $320,400 to set up the heads-up encounter, began the one-on-one clash with 6,760,000 chips against Habib’s 4,160,000. It took 36 hands for Kim to take down the top prize – during level 31 when the blinds were at 60,000/120,000 and a 20,000 ante – with the last hand seeing Kim raise to 240,000 and Habib call to see a flop of 9♦ 4♣ 2♦. Habib check-raised to 900,000 after Kim had opened for 300,000, only for Kim to rise from his seat, give it some thought, and then move all-in. That certainly gave Habib a lot to think about, but – after about two minutes – he called for the last 2,800,000 chips to reveal Q♣ 9♥ for a pair of nines, while Kim showed J♦ 7♦ to be searching for a diamond flush. The A♣ turn kept Habib in front, but the 8♦ river did give Kim his jack-high flush and the title. While Habib will be disappointed not to have won the $10,000 buy-in event, he also pocketed his largest prize – easily surpassing the $5,094 he collected when also finishing runner-up, along with team-mate Jorge Pineda, in the $500 buy-in No-Limit Hold’em Partners event at the 2009 Gold Rush tournament in San Francisco. The first exit of the day arrived after 113 hands – and the unfortunate player was Illinois’ Joseph Elpayaa, who picked up $128,200 for finishing in sixth place. Left with just 35,000, big blind Elpayaa was all-in, although, with the blinds at 25,000 and 50,000, Habib limped in from middle position, only for Connecticut’s Andrew Badecker to shove all-in for 1,360,000. Habib quickly folded. Badecker showed K♦ J♥, while Elpayaa revealed A♣ 6♣ to see a flop of J♦ 9♥ 8♥ that gave the former top pair. The turn of 3♣ and 9♦ river changed nothing and Elpayaa was off to collect his prize for finishing in sixth. Fifth place and $192,300 went to Badecker during level 28. On the button, Badecker raised to 130,000, big blind Kim moved all-in, and the former swiftly made the call with A♣ K♣. Kim turned over 4♦ 4♥ to be ahead as the flop came A♠ 5♠ 2♠ to give Badecker top pair. However, the 3♥ on the turn provided Kim with a five-high straight to secure the elimination. The unimportant 8♦ on the river completed the board. Canadian Cajelais took fourth place for $256,300 when being eliminated by Habib during level 29, with the blinds at 40,000/80,000 and a 10,000 ante. Under the gun, Habib raised to 200,000 with Cajelais, on the button, moving all-in for 460,000. Big blind Kim made the call, as did Habib, and both checked down to see a board of K♠ K♦ 7♥ 5♦ Q.
Kim showed A-8 for an ace high, while Quebec’s Cajelais flashed an ace before chucking his cards – obviously conceding defeat – and Habib showed Q-9 to take down the pot with two pair, kings and queens. Serock exited in third place when Kim, on the button, raised to 210,000, and the former went all-in for 1,020,000 from the big blind. Kim took his time but called with K♣ Q♣, while Serock turned over 9♣ 9♠ to be ahead. However, the 8♠ 6♦ 3♥ K♠ 7♦ board gave Kim a pair of kings that ensured his place in the heads-up decider. Day 3 had seen San Jose’s Amir Khaziri exit in seventh place as the official final table bubble boy for $64,000, while eighth went to New York’s Scott Baumstein, also for $64,000, ninth spot was filled by California’s Mike McClain and 10th went to San Jose’s Marko Trapani Jr – with the latter pair collecting $41,600 each. A total of 47 Shooting Stars started the tournament, with the last to fall being French-Canadian Jonathan Duhamel in 13th place for $25,620 when losing out to Habib – meaning no Shooting Star made the final table for the first time in this event’s history. That was Habib’s only bounty – which gave him $5,000 extra, as well as a signed T-shirt from Duhamel – while Kim could also only manage a single Shooting Star scalp when sending Nam Le to the rail on Day 2. But Quebec’s Duhamel did collect two bounties when eliminating fellow Team PokerStars Pros Bertrand ‘ElkY’ Grospellier and Jason Mercier (27th for $19,200), while three other players also recorded double Shooting Star knockouts. McClain sent Scott Seiver and JC Tran (16th for $25,620) to the rail, Serock busted Allen Cunningham (28th for $19,200) and Marvin Rettenmaier, and Michal Wywrot eliminated Eugene Katchalov and Todd Brunson. Other notable in-the-money finishers included Amir Lehavot (17th for $25,620), Josh Arieh (22nd for $22,420), Men ‘The Master’ Nguyen (23rd for $22,420), Bryce Yockey (34th for $16,000) and Everest Poker Pro team member Fabrice Soulier (35th for $16,000). Meanwhile, among the other Shooting Stars who failed to make the money were Faraz Jaka, Erik Seidel, Will ‘The Thrill’ Failla, Maria Ho, Dywte Pilgrim, Joe Hachem, Phil Hellmuth, Team PokerStars Pros Live Boeree, Daniel Negreanu, Barry Greenstein, Vanessa Selbst and David Williams, defending champion Alan Sternberg, Scotty Nguyen, Ben Lamb, Jennifer Harman, Lock Poker Pro Elite member Chris Moorman, Erick Lindgren, Team Party Poker Pro Mike Sexton, Chau Giang, Linda Johnson, Antonio Esfandiari and Mike ‘The Mouth’ Matusow. With 36 players paid, Andrew Watson just made the money for $16,000, while Carbon Poker Pro Kathy Liebert just missed out in 37th, as did David Pham in 38th.